A few years ago, the Russian government placed a minimum price on vodka because even Vladimir Putin knew that nothing good comes of liquor that’s too cheap. But apparently Applebee’s didn’t get the memo. 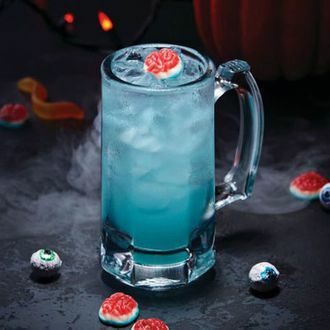 As part of its monthly dollar drink specials, the chain is now selling a zombie in a ten-ounce glass at the bargain-basement price of just $1 all month long. The rum drink, made with Applebee’s “own mix of pineapple, passion fruit, cherry, and lime flavors” also comes with a single gummy brain on top. Due to “legality” issues, the drink will only be available at select locations, which is probably for the best. Stay safe out there!